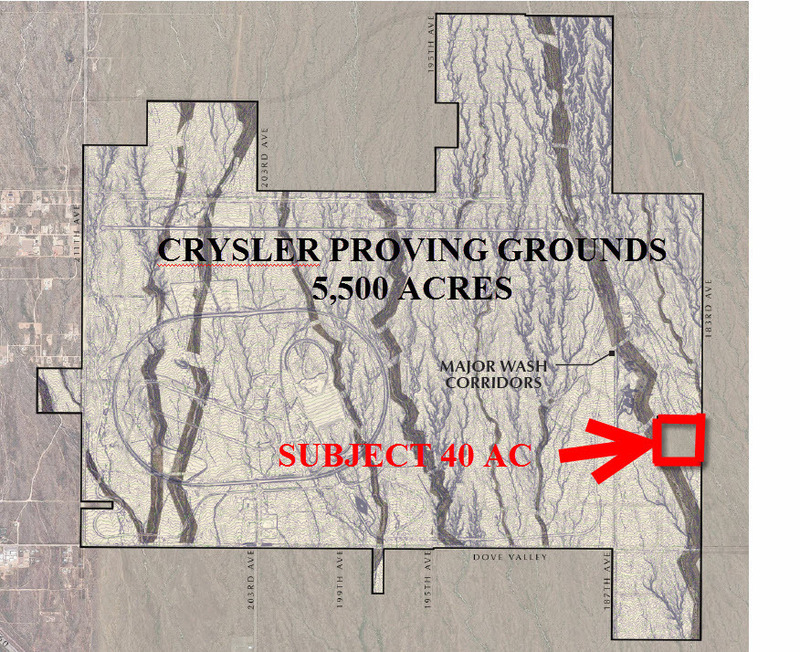 40 AC Within the 5,500 acres of the former Chrysler proving grounds Surprise Arizona. 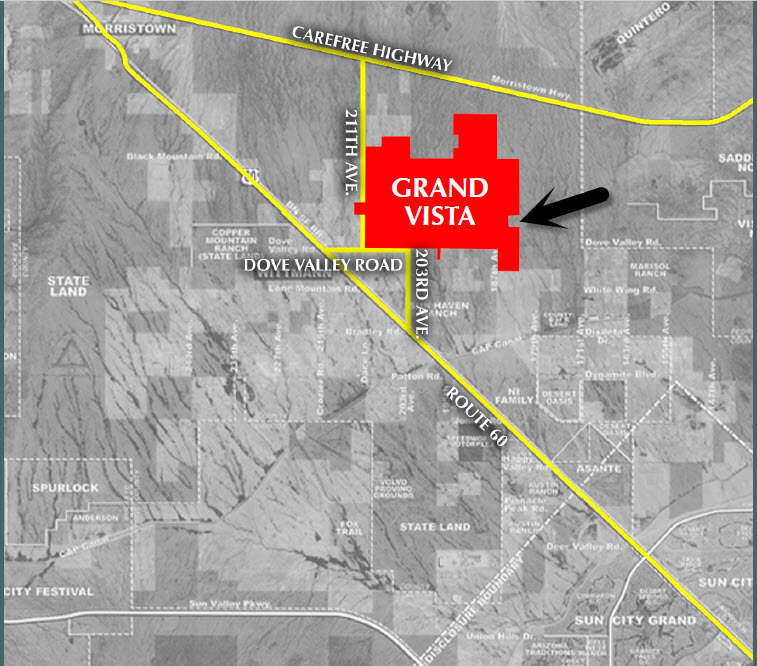 When unveiled during the housing boom of the mid-2000s, Grand Vista was touted as the largest master-planned community in the Northwest Valley. 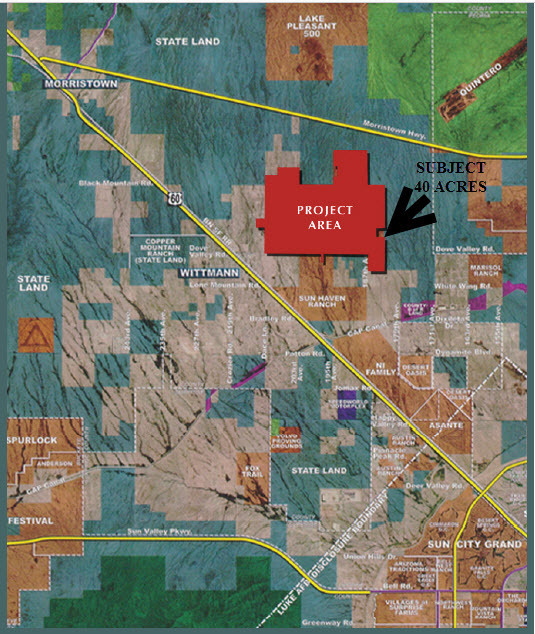 About 33,000 homes would roll out over the 5,500 acres of the former DaimlerChrysler proving grounds near Wittmann, several miles north of Loop 303 on Grand Avenue. Six years later, the old proving grounds are still undisturbed desert. And the acres appear destined to stay that way for at least another half decade despite the landowner’s recent effort to scale back the project. A smaller, more flexible project may help the lender attract a buyer or developer, an expert said. In January, the project’s lender, New York-based iStar Financial, began working with Surprise to downsize the proposed development. Under the revised plan, one of the two golf courses would be eliminated, neighborhood parks would be added and the community would have a “central core” design instead of sprawl. The number of single-family homes would be reduced by 350 units and multifamily homes would be decreased by 175 units. Surprise spokeswoman Diane Arthur said that iStar has not submitted any formal plans for approval and that city planners have not heard from the company since early April. “We’re trying to bring down the upfront infrastructure costs,” said Wendy Riddell, a Scottsdale lawyer who represented iStar before the Surprise Planning and Zoning Commission on April 4. “We think this will be well embraced by the community since it signals a reduction in intensity,” Riddell told the commissioners. Executives with iStar would not comment in detail about Grand Vista plans. Those changes could make the property more attractive to developers, said Gregg Wolin, founder of the real-estate investment company Crescent Bay Holdings. He added that many lenders who foreclosed on land during the recession years are still holding their property since values remain somewhat low. But prices slowly are rising again, and Grand Vista could prove to be a test case for other stalled master-planned projects if the land sells or a developer partners with iStar. “Because iStar is not an owner by choice, I suspect they will want to figure out a way to exit,” Wolin said. “Everybody is keeping an eye on it. 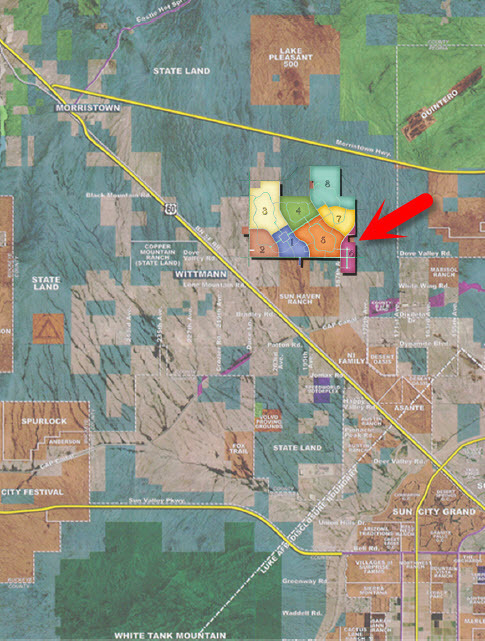 We’re all watching to see what happens.” Back in planning The original 2005 land deal that paved the way for Grand Vista was one of the largest land sales ever recorded in Arizona. Toll Brothers homebuilders and its partners paid $312 million for it, or about $56,000 an acre. The price, even for those feverish years, was what one real-estate investor called “staggering.” In 2008, Surprise annexed the land, making it a permanent part of the city. Work was set to start in 2010 on the houses, five elementary schools, a high school, parks and commercial development. The Grand Vista deal also helped Surprise move toward its eventual goal of annexing about 300 square miles, reaching toward Wittmann, Circle City, Morristown and northward to the Yavapai County line, according to the city’s General Plan. At the time, some Wittmann residents were appalled at the idea of this city-size suburb sprouting next to their rural enclave. In response, developers Toll Brothers and Meritage Home slashed the housing units to 16,500 and increased the undeveloped open space to 756 acres from 193. During those boom years, it appeared the time was right to build homes on the fringes of the Valley’s westernmost suburbs. Grand Vista is an example of that era. Since houses were being sold so fast, builders began working on their own communities, a job usually left to development companies. “The homebuilders became the developers,” Wolin said. “They went into these ventures where they paid huge dollar prices upfront.” Today’s market is transformed. Land values have fallen sharply. While builders have begun erecting homes in existing neighborhoods, the pace of building new master-planned communities remains slow. The Maricopa County Assessor’s Office has appraised the total market value of the Grand Vista land at $17.6 million for the 2014 tax year. The property has been leased to a rancher since 2009 and has an agricultural designation, said David Beau Boisvert, chief appraiser for the county assessor. IStar likely is seeking changes to “entitlements,” which stipulate what can be built on the site, to make it more attractive to potential buyers or developers, Wolin said. Those potential buyers or developers are not likely to show up anytime soon in the still-recovering economy, he added. “The capital required to do these kind of projects is gigantic,” Wolin said. “The infrastructure issues (of installing water, sewer and roads) are so vast and massive.” Wittmann waits Wittmann residents, who initially bristled at Surprise’s encroachment on their tiny community, seem less emotional about Grand Vista now. After years of recession, some residents said it would be good to have new homeowners, whose taxes could help pay for improved services, such as schools. “We’re rural out here, and we kind of like that lifestyle,” said Sue Dolphin, a Wittmann resident and member of the Nadaburg Unified School District board. Even if it gives the community an economic jolt, Dolphin said, she is disheartened by the number of people Grand Vista would bring. “We worried about transportation and gridlock on Grand Avenue,” she said. “Nobody is really for it (Grand Vista), but for the economy and the school district, it would be great.” Justin Smith, a Wittmann business owner, said he looked forward to welcoming new Grand Vista homeowners. “The only thing that’s there is the security guard for the Chrysler proving grounds,” he said. “It’s been five years since anyone was out there testing wells or anything. I’d like to see it.” Timeline for Grand Vista development 2005: Toll Brothers homebuilders and partners buy the 5,500-acre DaimlerChrysler proving grounds near Wittmann for $312 million. 2007: Wittmann residents protest design plans calling for 33,000 homes near the rural community. The development partners slash the number of homes to 16,500. 2008: Surprise annexes the Grand Vista property, opening the way for the developers to begin work. Construction is set to begin in 2010. 2010: Developers default on their loan. The property reverts to iStar Financial. 2013: Landowner iStar begins process to seek minor changes on initial development plans, possibly to prepare the land for sale or seek a new developer. Within the DaimlerChrysler proving grounds / Surprise Arizona. / now called Grand Vista. Landowner iStar begins process to seek minor changes on initial development plans, possibly to prepare the land for sale or seek a new developer.